Chelsea Clock has been part of maritime history for over a century. Since 1897, Chelsea Clock has hand crafted nautical timepieces that are as much works of art as they are practical. 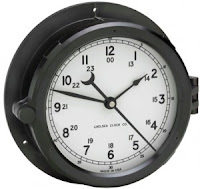 Chelsea’s Military Clock collection includes two reproduction clocks that are a tribute to clocks that were commissioned by the US Navy during WWII. These aren’t just timepieces they are also pieces of history. During the WWII metal shortage, the US Navy asked Chelsea to create a clock that wouldn’t use the traditional brass casing yet would stand up to the rigors of life aboard a war ship. Chelsea Clock responded with a phenolic resin casing that is lightweight yet far more rugged than traditional plastic. This same phenolic casing is used in today’s Patriot and Radio Room clocks. Don’t confuse "light-weight" with "flimsy" as this most definitely is not the case. These clocks feel substantial and are definitely well made. • A Duracell battery and three black mounting screws that match the casing. Note: it’s great that they think of including a battery and that it’s a quality battery! 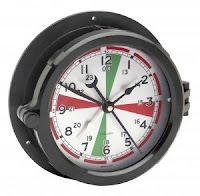 The "Patriot" is a reproduction of the WWII era engine room clocks which were used aboard thousands of naval vessels. 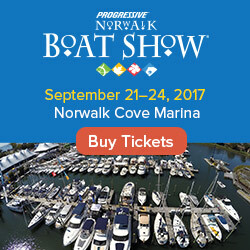 The clock’s phenolic casing makes it lightweight and easy to hang on a wall or perfect for use on board a boat. The Patriot is a 6” military–style face with both 12- and 24-hour markings making it true to the era. It also has a hinged bezel that is secured by a large locking lug that secures the bezel firmly to the clock and forms a water resistant seal. There are two versions of the Patriot, one with a white dial and black numerals and hands as well and the other has a black dial with white hands and numerals. Both styles have a black casing that gives them an attractive and classic look. • The red markings indicate two (2) three minute periods each hour where radio operators observe periods of radio silence (at 500KHz) and listened for international distress calls. • There are also two three minute periods marked in green which designate times when radio operators would listen for coastal distress calls while not transmitting on 2182 KHz. 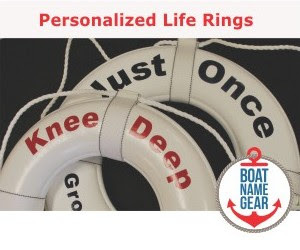 • The 4 minute red markings on the outer edge indicate times to broadcast signals and the 1 minute unmarked times are when distressed vessels listed for responses. The sinking of the Titanic in 1912 inspired the Radio Act of 1912 that required 2-hour radio watches at sea to listen for distress calls. This Act led to the design of the ‘Radio Room Clock’ used aboard ships. This clock has a black phenolic casing so it is lightweight yet rugged and carries that classic look. This clock really stands out as authentic and functional vs. simply being a decorative piece. The Radio Room Clock has both 12- and 24-hour markings on its traditional military style face and sweep second hand. The clock also has an additional Zulu hour hand (white vs. the black primary hour hand) that is traditionally set to Greenwich Mean Time. The Patriot and Radio Room Clocks are secured to the wall or bulkhead with three screws included with the clock. The battery is changed by opening the bezel and removing the face of the clock. If you have a fondness for historical artifacts or the WWII period of history or know people who served in the military (during this period or any other) these clocks will inspire memories and emotion of all that the tradition of military service stands for. You can get more information or purchase these clocks on the Chelsea Clock website.